Diet: Paleo, Steves Original Paleo . He Drinks whole milk and also likes peanut butter. His wife Hillary’s diet. He also mixes Progenex Recovery and Progenex More Muscle for the extra effect. You can read more on the whole Rich Froning peanut butter phenomenon in the CrossFit Journal. Everyone wants to know what Rich Froning wears – He wore Oakley Jury Sunglasses in the CrossFit Games 2013 and has been seen sporting them around at many events. Galatians 6:14 (NIV) May I never boast except in the cross of our Lord Jesus Christ, through which the world has been crucified to me, and I to the world. 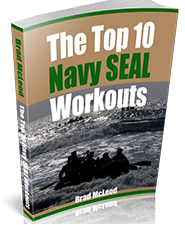 Rich constantly varies his workouts with no particular rhyme or reason and follows basic CrossFit protocol (constantly varied workouts with intensity). He has made the switch from Oly weightlifting shoes to Reebok Nano’s in 2013. He appeared in a recent issue of People magazine number where he talked about his nutrition, workouts and faith in God. Jason Khalipa and Neal Maddox are two of Rich’s biggest competitors and are both close behind him in the CrossFit Open 2013. Jason Khalipa currently leads the CrossFit Open 12.4 workoutJason Khalipa CrossFit Elite Athlete Profile. 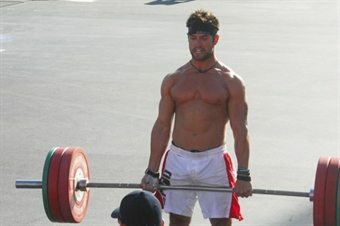 pat Barber is also ranking high in the CrossFit Open. Read more about Pat Barber here. 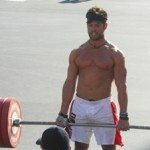 An interesting question we got on the website was “what does a pro crossfitter bench?”. The answer is that they probably don’t know as many of them don’t bench press. It is not a very functional exercise. When was the last time you laid on your back and had to press something up? In wrestling you press your opponent up but that is often to the side at an angle. You are better off using a sand bag than a barbell. To answer the question of “How much does Rich Froning bench press?”. Rich bench pressed 335 lbs in 2012. Question: Does Rich Froning drink alcohol? We don’t believe that he drinks alcohol both from his faith and that he is an elite athlete. Question: What protein does he use? Rich used Progenex, then BSN, and now Advocare supplements. Question: what hand guards does rich froning use? Check out these gymnastic grips that Rich uses for high intensity pull up workouts. Question: How does he stack up against pro weightlifters? He would be near the podium or on the podium for national Olympic lifting. 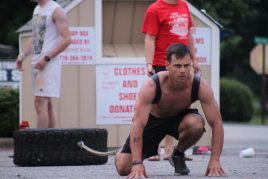 Question: What does he have to say about crossfit haters? Huh? What Gear Do You Use Rich Froning?